Seething suburban voters are threatening the re-election prospects of longtime Democratic Congresswoman Nita Lowey (D-Westchester/Rockland) and markedly constraining the margin of victory for Governor Andrew Cuomo. The vaunted Democratic get-out-the-vote operation will likely carry the day in the end, but it is battling some of the most pissed off people in America. 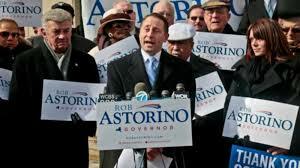 Money certainly isn’t buying happiness for affluent suburban voters- and their discontent may be enough to allow Republican gubernatorial candidate Rob Astorino to deliver an embarrassing loss to Cuomo in Westchester County, where Astorino is the current chief executive and Cuomo lives. Cuomo carried Westchester with 66% of the vote in 2010. Westchester residents and other voters in the New York City suburbs are super-sour about the state of the union. According to a survey conducted ten days ago by the Siena College Polling Institute, 69% of suburban voters think the United States is going in the wrong direction. Despite their persistent foul mood about the nation’s direction, Sienna’s pollsters found as recently as a month ago that suburban voters still believed New York State was going in the right direction. But the newer data shows that suburbanites are gloomy about New York too. Last week, Siena reported that voters in the suburbs now believe the state is headed in the wrong direction by a margin of 53 to 40. Even in economically challenged upstate, voters who believe things are in the state are going in the wrong direction only narrowly edge those with a positive view. And it’s a world away from New York City, where voters who believe things are going well outnumber those think they aren’t by a 20-point margin. This suburban angst steams from a politically toxic brew of relentless property tax hikes, anxiety over diversifying schools and shock over seemingly ceaseless land development. Despite a Cuomo-enacted 2% cap on property tax increases, well-to-do retirees and new suburban homeowners both blame state government for property tax bills exceeding $15,000 a year. 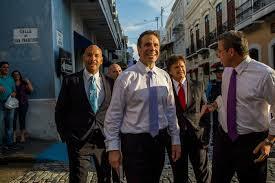 Intensifying suburban discontent is lifting Astorino’s suburban support. Astorino now edges out Cuomo by 2 points in the suburbs (46-44) after trailing him in the region by 19 points (33-52) in September. That means nearly every suburban voter who made up their mind in the past four weeks opted for Astorino. The Republican made six stops in Suffolk County Sunday and may put the county in his win column on November 4th despite a nearly certain statewide loss. Cuomo’s suburban slide also reflects wariness of New York City Mayor Bill de Blasio’s urban agenda, which includes personal income tax hikes. De Blasio secured Cuomo’s support for a joint effort with the labor-funded Working Families Party to shift the state Legislature to the political left and change spending practices to shift state aid from other regions to New York City. In exchange, the party endorsed the more moderate Cuomo. But the deal to remove Republicans from leadership of the Senate landed with a thud on Long Island, home of the current Senate leader. The powerful Newsday editorial board warns of dire consequences for suburban taxpayers if De Blasio’s Democratic allies carried the day. “Just how afraid should Long Islanders be of the Democratic Party taking control of the New York State Senate?” the paper’s editors asked last week. None of this is lost on Cuomo. A recent pro-Cuomo mailer from the State Democratic Party credited the Republican-run State Senate, rather than the Democratic-led Assembly, for passing his property tax cap. Brief, high profile trips this season to Puerto Rico, the Dominican Republic and Israel gave honor to critical constituencies. As a result, the Governor has stitched together a motley coalition of upstate Republican business leaders, minority voters, GOP-averse women and Jews to withstand the bad luck wind. Cuomo acknowledged last month that “A governor becomes a sort of barometer of the times, and these are troubling times; these are scary times.” Cuomo’s firmer than expected line on an Ebola quarantine, and convenient spat over it with suburban bête noires Obama and DeBlasio, is an unmistakable signal to anxious and angry suburban voters to stick with man currently in charge. But even with an endorsement from the Republican Nassau County Executive, a new bridge rising on the Hudson and the ability to outspend Astorino 15-1 this week, there is a reason the Times is chronicling Cuomo’s “obsession” with visiting Buffalo: the governor is scouring for enough of the upstate votes he lost in 2010 to make up for the current cold shoulder from his estranged suburban neighbors. Cuomo’s courting of upstate voters and careful tending to ethnic constituencies demonstrates just how methodically the governor’s campaign has prepared for what it always knew would be a real, if not fully competitive, race. But Cuomo’s longtime ally Congresswoman Nita Lowey was caught embarrassingly flat-footed by the suburbs’ shifting political sands and is struggling to retain the House seat she has held since 1988. The nearly 2 to 1 Democratic enrollment edge in New York’s 17th Congressional district was supposed to protect Lowey from any credible challenge to her twenty-five year reign. Even as her district shifted north to include all of Rockland County, no one ever put Lowey on a congressional watch list. But the terrain has been growing less friendly to Lowey for some time. In 2009, Astorino ousted the longtime Democratic county executive of Westchester. Last year, Rockland voters extended the Republicans’ 20-year hold on their county government, soundly rejecting the Democrat, a former Lowey aide. Democrats significantly outnumber Republican voters in both counties. Lowey could lose. And she knows it. Last week, her campaign launched a direct mail assault on her Republican rival, 29-year old Army vet and Yale grad Chris Day, who has never held elective office and can’t afford any campaign mailings. According to the Federal Elections Commission, Day spent less than $10,000 during the last expenditure reporting period. He has run an intense digital campaign, with social media chronicling a fearsome campaign schedule. The literature smelled like a combination of fresh ink and desperation. Lowey’s challenge reflects a dangerous mix of the broader anti-incumbent, anti-Obama mood in the region and personal political missteps. Lowey keeps a far lower profile at community events in the district compared with Eliot Engel, the Congressman who represented large swaths of the area until 2012 and was omnipresent despite his Bronx political base. And the wealthy Congresswoman has not connected with constituents in the Rockland County portion of district, where very rich candidates for public office are unusual. But ever since an August poll conducted for her campaign by the Global Strategy Group showed support for her re-election to be Pillsbury-dough boy soft, Lowey opened the spending floodgates in an all out effort to save her political hide. According to the Federal Elections Commission, Lowey is on track to spend over $1 million in just three months- an unheard of sum for a longtime incumbent in a district with 2:1 partisan advantage. 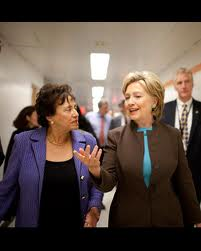 Lowey even pulled Hillary Clinton off of a national fundraising tour for embattled Democrats for a Manhattan fundraiser. 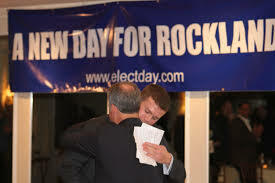 GOP Congressional candidate Chris Day (r) congratulates his father, Rockland County Executive Ed Day, on Election Night 2013. The numbers tell the story: in the closing weeks of her 2012 re-election bid, Lowey sent $165,000 to the state’s Democratic Party to aid other candidates. This time, Lowey is spending it on herself. Her last financial filing shows nearly $400,000 in bills for a dozen direct mail pieces and television ads for her own re-election and not a dime for the state party. Strangely, none of Lowey’s campaign mailers mention any issue specific to the Westchester/Rockland district she represents. And the Congresswoman remains far in the media background on the major issues facing her district, from the new cross-Hudson Tappan Zee Bridge to the fate of the nationally-known and troubled East Ramapo School District. Lowey still has a loyal following in Westchester, despite the strong Republican vote that will be pulled out there by Astorino’s gubernatorial campaign. And Hasidic leaders in Rockland are giving her a reluctant blessing because of their dislike for her rival and his father Ed, who was elected Rockland County Executive last year on platform opposing that community’s growth. But after this year’s bruising campaign, it’s likely her next term will be her last. Nita may be senile, but what excuse does her staff have? As Ryan correctly points out she seems to have ignored any and all local issues. Other elected leaders at the county and state level have opposed the New Square chicken slaughter house. What is her position? And then we have the destruction of the East Ramapo schools by Cuomo’s and the state legislature’s refusal to recognize how destructive the state aid formula is for public school students. Then we have the arrogant, nasty, and illegal efforts of the East Ramapo Jasodoc school bpard to push every possible nickel toward religious schools. Nita has been fully inforrmed of these problems and has said nothing to her friend Cuomo. So why should anyone vote for someone who seems completly unaware and/or unwilling to deal with local issues. Ryan, get yourself a decent web builder. This purple is terrible!!! !